So, I got to take a trip to the Games Workshop store in the Plaza on Oxford Street at the weekend. In London. All by myself. Well, I travelled all by myself. I was greeted at Kings Cross by my dad and brother who travelled up to meet me for lunch. Which was very pleasant indeed. It was about a gazillion degrees, which is slightly unnatural for the 1st October and three and a half hours on the train left me feeling decidedly warm. I joined up with the very delightful Nick Kyme who was signing copies of his latest release, Nocturne. It’s the last book in his highly enjoyed Tome of Fire trilogy. I finished it on Saturday morning before I left for London and in response to his ‘how did you find it’ question, I gave him a lower lip sad look. I’ve enjoyed the series and am sad that it’s over. It was a highly enjoyable afternoon of signing copies of The Gildar Rift and meeting more incredibly nice people – including fine folks from the Bolthole, the Overlords and one guy I’ve known for about 23 years and who I haven’t seen for over 10. He came into town just to see me, which was outstandingly decent of him. The mighty James Swallow rolled by to give us support (and to eat my Haribo) and it’s always a pleasure to see him. 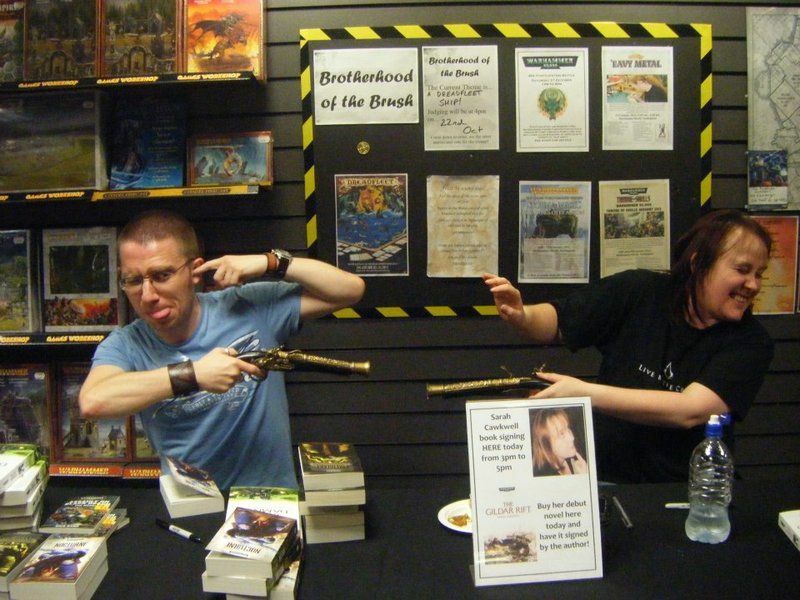 Much fun was had; Nick and I were photographed shooting each other with plastic flint lock pistols… (the store had gone all piratical in honour of the release of Dread Fleet. Which is, by the way, utterly gorgeous and is sitting on the side waiting to be played). This is what happens when an author turns in a late manuscript. No, really. Finished the signing and crossed Very Hot London back to Kings Cross for my 17:30 train back home. Got onto the train with ten minutes to spare, found my seat and settled down with my copy of Hammer & Anvil (I’d finished Faith & Fire on the way up to London*) and got comfy. 17:55, the driver sheepishly announced that ‘the engineers couldn’t fix the problem, but THAT’S OK PEOPLE! If you cross the platform, that train next to you will take you where you need to be. In the traditional scrum that ensues in these situations, I crammed everything back into my backpack and followed everyone else across the platform onto the other train. I re-settled and caught the eye of the lady sitting opposite. We chuckled about the confusion of it all and established, quite cheerfully, that OK, we were now 30 minutes late, but if we were on the wrong train, we would all have a Great Adventure together and wouldn’t be lonely. It was all lighthearted and a lot of fun. 18:00 (ish), the train pulls out of the station. 18:02, the woman sitting in front of me starts to complain. She complains that she’s late. She complains that she’s not in the seat she was reserved (note: the train was half-empty and was de-classified. She could have sat in First Fecking Class if she’d wanted to). She complains that it’s too hot on the train. She complains that the wi-fi is a bit rubbish. She complains about everything. She has a go at first the refreshment chap and then the ticket inspector. Then she has a go at the refreshment chap as he goes by a second time. All the way to Doncaster. When she got off, about seven people in the carriage genuinely cheered. I wasn’t one of them, but I was joining in silently. Seriously. It was the most irritating thing I’ve ever heard on a train. It was the fact that she eventually started complaining about pathetic things. The coffee didn’t taste right. The sky was the wrong shade of blue. When I was growing up, my dad worked for what was then British Rail. I always remember a little poem he told me about the communication cord, for which you get a fine if you pull it without good reason. It used to be £50. Do they even have them any more? Or would you just Tweet up to the driver and say ‘STOP THE TRAIN!’ ? Then leave the bloody thing alone. I tell you what, I’d have paid £50 gladly to get this woman put off the train. I’d have paid £100 if she had been THROWN off. And that’s just it, isn’t it? She was so typical of people in this country. Lightning fast to complain, but never comment when they receive good customer service. Once, in Sainsbury’s, there was a checkout lady who was just so, so nice. She saw I was struggling with a full load of shopping and a then-one year old baby and she helped me pack and even told off the person behind me when they tutted loudly about how slowly the queue was moving. I stopped at the customer service desk on the way out and asked for a form so I could leave a compliment and thank you note for the member of staff. The two girls behind the counter blinked slowly and looked at each other. The one disappeared behind the counter and then re-emerged with a sheaf of paper that had a layer of dust about seven inches thick on top of it. Spiders had lived and died for generations on that pile of paper. Archaeologists could have found evidence of tiny civilisations if they’d looked hard enough. The vocal minority likes to complain far too much. Let’s start a new trend! Why not make it a focus, the next time you receive great customer service, to compliment the person behind the counter who smiles at you? Or to tell their manager on the way out the door? Or to phone their head office and say ‘so and so was great – thank you!’ My mother worked for years in a shop and she always got a huge kick out of people thanking her. She gave me many tips for life and one of those was ‘thank you costs nothing and means everything’. With that in mind, thank you for listening to this brief rant. my latest short story, Bitter End – featuring Huron Blackheart being a back-stabby git – is now available in the latest ish of Hammer & Bolter (12). Valkia the Bloody is now more than 85% complete and should probably hit first draft stage in the next couple of weeks. I am swamping my poor editor with ideas. He may have drowned by now. The Gildar Rift is due out on 5th December, but there are at least two more signing events planned – 12th November at Games Workshop in Durham and 19th November at Warhammer World in Nottingham. There may be more yet… watch this space! Check out this pretty damn fine advance review (spoiler free!) of The Gildar Rift by the illustrious Shadowhawk. This entry was posted in General, Reading, Writing and tagged Black Library, Gildar Rift, I'm an author now, life, ranting, Reviews, Silver Skulls, W40K, weekend, Writing. Having worked in customer service, I’ve found nine out of ten people will find something to complain bitterly about, while that one person will be gracious and kind as the staff tries to resolve the problem. For that one customer who goes out of their way to be kind and decent to the staff, it’s noted and they try all the harder to help the polite person. For those other nine… we’re silently happy when they trot out the door and wish them to never return.